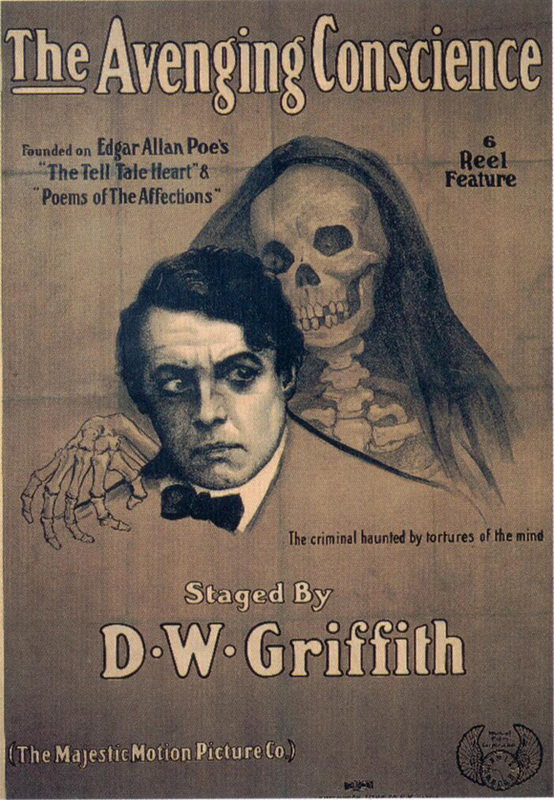 The Avenging Conscience: or “Thou Shalt Not Kill” is a 1914 silent horror drama film directed by D. W. Griffith. The film is based on the Edgar Allan Poe short story “The Tell-Tale Heart” and the poem “Annabel Lee”. A young man (Henry B. Walthall) falls in love with a beautiful woman (Blanche Sweet), but is prevented by his uncle (Spottiswoode Aitken) from pursuing her. Tormented by visions of death and suffering and deciding that murder is the way of things, the young man kills his uncle and builds a wall to hide the body. The young man’s torment continues, this time caused by guilt over murdering his uncle, and he becomes sensitive to slight noises, like the tapping of a shoe or the crying of a bird. The ghost of his uncle begins appearing to him and, as he gradually loses his grip on reality, the police figure out what he has done and chase him down. In the ending sequence, we learn that the experience was all a dream and that his uncle is really alive.